Missionaries Rev. 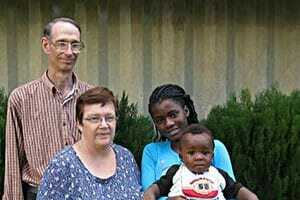 Chuck and Karen Tessaro first set foot in Nigeria in 1985. Since then, they’ve been helping to get God’s Word out. They have been doing this by getting the Word into people’s hands and hearts by working with local people to successfully translate the New Testament into the Eleme language. They serve with multiple local translation teams including the Old Testament teams for the Yala, Kukele and Gokana languages. These teams also promote literacy and serve in their local community as teachers and helpers. “Our joy is at its height when we see the Holy Spirit at work in the hearts and lives of people we’ve helped train, reading the Bible in their local language with confidence and familiarity, and discussing what it means and how it applies to their lives,” Chuck says. The Tessaros met and married at Concordia College, Ann Arbor, Mich. By the time Chuck had graduated from Concordia Theological Seminary in Fort Wayne, IN, their family had grown to four. Called to serve on a translation team in Nigeria, the Tessaros spent a year at the Summer Institute of Linguistics in Texas before heading for Africa. Since finishing the Eleme New Testament in 2002 and assisting with the consultant checking of the Ikwerre New Testament in 2010, Chuck and Karen are principally responsible for mentoring LBT’s International Associates in Nigeria and training and consulting with various Old Testament translation teams.